2.9 x 2.7 x 2.1 in. Gone, perhaps, are the days of often-chunky cases with snap-on or magnetically-attached mini lenses or novelty accessories that let you put DSLR lenses on the back of your smartphone. Photographers looking for the flexibility of interchangeable lenses, the image quality of a large-sensor camera, but still want the instant "shareability" of a smartphone photo or video, need look no further. Expanding upon their uniquely-designed lens-style cameras, Sony has unveiled what's arguably the first "interchangeable lens smartphone camera." The Sony QX1 marries the basic form and design of their small, barrel-shaped snap-on, smartphone-controlled QX-cameras with the large 20.1-megapixel Exmor APS-C CMOS sensor a la the Sony A5000 and a fully functional E-mount lens flange. The QX1 takes smartphone photography to the next level allowing Sony mirrorless camera owners to use their E-mount lenses on their Android or iOS smartphones to shoot practically everything their mirrorless camera could, from landscapes and portraits to macros and even telephoto shots. 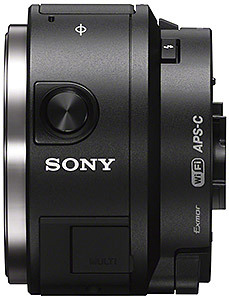 Sony DSLR shooters can come along for the ride as well by using a Sony A-mount to E-mount adapter. 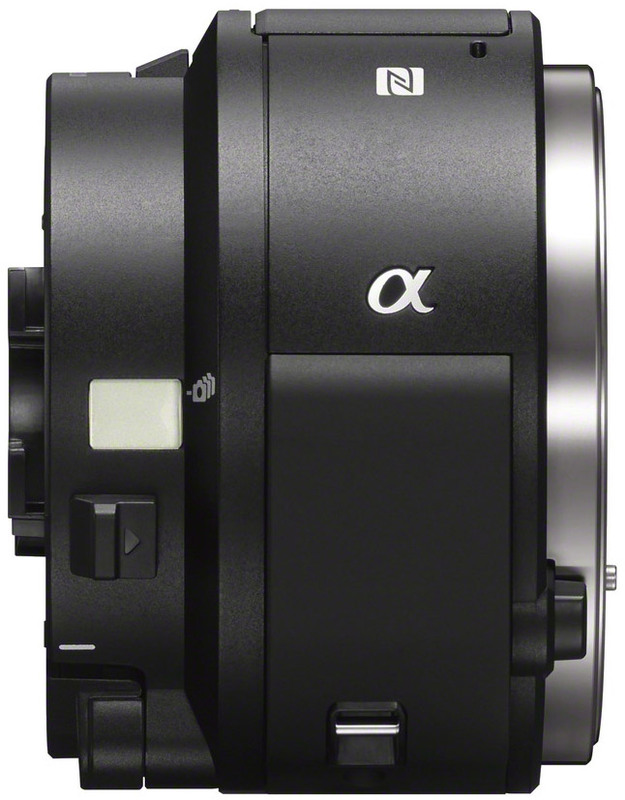 The QX1 "system" -- your smartphone is now a mirrorless ILC. Featuring image quality similar to Sony mirrorless cameras, the QX1 provides smartphone-based photographers a slew of characteristics normally reserved for dedicated standalone cameras. The new QX1 features a large APS-C sensor and Sony's powerful BIONZ X image processor for vastly improved image quality over that from the small-chipped cameras built into today's smartphones. The lens-style camera has an ISO range from 100 up to an impressive 16,000, and when combined with a fast, bright E-mount lens, you'll be "Instagramming" superior "bokeh-fied" photos from bars, parties and other low-light situations in no time. Need a bit more light, though? The QX1 also houses a built-in pop-up flash! For the more enthusiast photographer, the QX1 includes a host of advanced features, including RAW+JPEG capture (including the ability to transfer RAW files to Android devices -- no iOS devices for that feature at this time); Program, Aperture Priority and Shutter Priority exposure modes (though no full Manual mode); Lock-on AF; and 1080/30p Full HD video. While the new QX30 "superzoom" QX camera features a continuous burst rate of up to 10fps, the QX1 on the other hand is a lot slower at 3.5fps in Speed Priority continuous mode or 2.5fps in standard continuous mode. Buffer capacity of the QX1 is up to 23 Large/Fine JPEG frames in standard mode, and 15 frames in Speed Priority. When shooting standard quality JPEGs, this increases to a healthy 68 JPEGs in normal continuous mode, and 30 frames in Speed Priority mode. 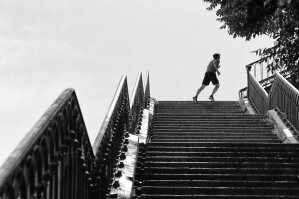 However, buffer performance takes a hit for RAW+JPEG shooting, with only a 5-frame capacity for both Speed Priority and normal continuous shooting modes. This "mini-E-mount camera" unsurprisingly uses microSD cards for storage, with microSDHC and microSDXC compatibility. You also have the option of using Sony's MemoryStick Micro and MemoryStick Micro Mark II memory cards. 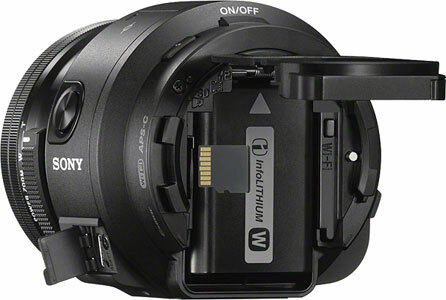 Of course, a critical feature of the QX1, like other QX cameras, is wireless connectivity to the companion smart device. The QX1 includes Wi-Fi (802.11b/g/n) and NFC (Type 3) connectivity. For power, the QX1 includes a rechargeable NP-FW50 lithium-ion battery pack that's CIPA-rated for approximately 440 shots, or up to around 150 minutes of continuous video recording. The QX1 is recharged in-camera via a Micro USB cable, however an external AC adapter (AC-PW20) is sold separately for extended shooting sessions. 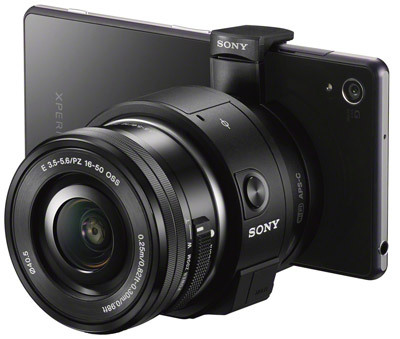 For higher quality selfies, unique and creative remote shooting and an all-around compact, mobile photography solution, the new Sony QX1 lens-style camera is sure to take your smartphone photography in a whole new direction. Set to be available in November, the Sony QX1 lens-style camera will have a retail price of around US$400. Lenses, are of course, extra.